A little known fact about me is that I love watching Korean soaps and sometimes, it can get so bad that I can't seem to stop. What's even worse is having access to all episodes in one sitting (gah!) After two days of watching almost 8 out of the 25 episodes, I decided to nip this problem in the bud by skipping to episode 12 (since it's the series' midpoint), then to episode 25, the last one. Since there's usually some sort of love triangle in Korean soaps I thought that if I forwarded to the last episode, I can pretty much skip alot of the in-between drama and hoo-hah and find out which guy the girl ends up with. Then my life can return to normal again and I can once again become my productive self. I know, I know, it's cheating but this is what I call "speed soaping with Hulu" and I think it worked out great for me. Abalone porridge from ep. 25. I didn't have any abalone but I did have shrimp as well as all the other ingredients so I went ahead and made a shrimp version instead. Well, it did not disappoint and it totally hit the spot. When I can get my hands on some abalone, I'll definitely be making this again. It's easy to cook and it is tasty as it is comforting. 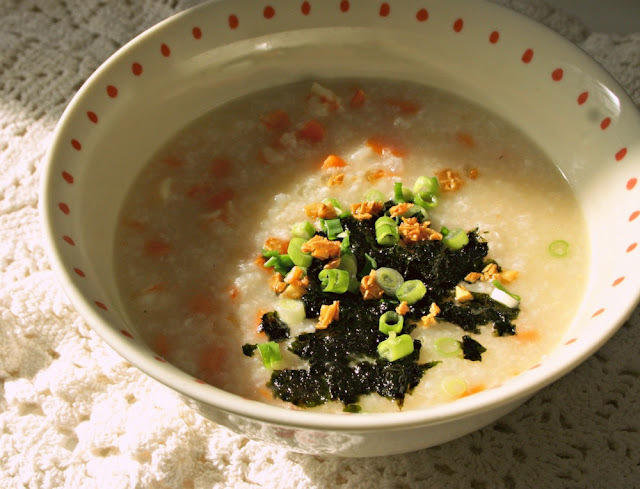 Korean porridge is not so different from Chinese porridge. The only difference is their use of sesame oil to saute the ingredients as well as the seaweed topping. Since I'm a garlic fanatic, I drizzled a little garlic oil (with toasted garlic bits) on top too. 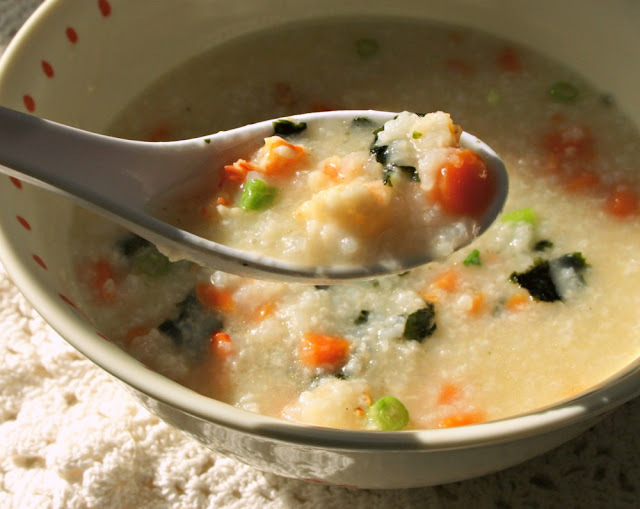 Adapted from Maangchi's Abalone porridge recipe. Makes 4 to 5 servings. Heat the sesame oil in a large pot over medium heat. Saute the garlic until fragrant. Add the carrots and the shrimp and stir everything together for 30 seconds. Add the rice and continue stirring everything together until the rice becomes translucent. Add the water to the pot and bring to a boil. Reduce heat to low and simmer for 30 minutes to an hour, or until the rice has broken down almost completely and has a thick consistency. Add the fish sauce and salt to taste. Serve in bowls and top with the roasted seaweed, green onions and a little more sesame oil (or garlic oil!) if desired.